Thanks to the number of well-positioned bars and restaurants in London, it's easy to appreciate the fireworks without having to stand around in the dark being bothered by the cold or small children who are high on toffee apples. London Town reports on some of the best venues to watch fireworks or to enjoy Bonfire Night away from the crowds. Campfire cocktails in a secret rooftop garden above Brunel's Thames Tunnel. Name checked by Elle and The Daily Telegraph, the Midnight Apothecary has proved to be a sure-fire hit (no pun intended). Returning for its seventh Bonfire Night special, Midnight Apothecary is a cocktail party with a difference. Set in The Brunel Museum's beautiful rooftop garden, the special event involves themed cocktails based on ingredients in the garden, a roaring fire pit on which to toast marshmallows, apple bobbing and food from Surrey Docks Farm's highly acclaimed Piccalilli Caff. They promise you'll get all the fireworks you need in the cocktails. The 28th floor Park Lane restaurant offers a great spot to watch the fireworks across London. For anyone visiting London on Bonfire Night, Galvin at Windows is as central as it gets and one way of seeing the whole city without leaving your table. The restaurant is situated on the 28th floor of the Hilton hotel on Park Lane and enjoys 360° views of the city, which affords it particularly spectacular views of the fireworks on Bonfire Night. The Michelin-starred restaurant serves seasonally inspired modern French haute cuisine created by head chef Joo Won and his team. Described in Elle as having one of the best pub gardens in London. The Magic Garden is indeed magically positioned for Bonfire Night, just across the road from the Battersea Park fireworks extravaganza. It's a great venue for the after party or simply to warm up for a bit and avoid any possible rain (fingers crossed!). 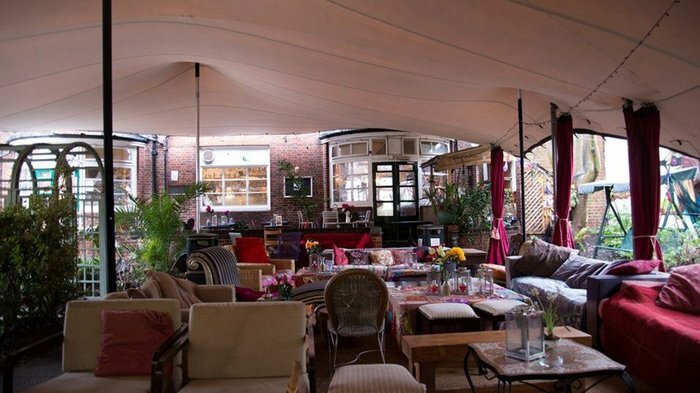 The pub - if it still fits within the confines of that definition - has a vast outdoor space that's semi-covered with awnings and was described in Elle as being one of the best pub gardens in London. The décor is part Bedouin tent, part Victorian curiosity shop with a real mismatch of furniture. Fireworks from 244 metres up with 360-degree views for up to 40 miles. Visitors to The View From The Shard get the benefit of being 244 metres up on Bonfire Night, from where you can see fireworks set off in Battersea and for miles beyond. The public viewing platform on the 72nd floor of the highest building in Western Europe offers stunning views over the city and 40 miles beyond so, depending on the weather, you could see fireworks set off between London and the sea at Southend in Essex. If you prefer to enjoy the displays over dinner book in at one of the restaurants in the Shard Aqua Shard or Hutong for modern Chinese delicacies on the 33rd floor. See numerous firework displays from the Orbit's viewing platform. Providing the chance to enjoy more than just one firework display, the ArcelorMittal Orbit is opening its door late-night this Bonfire Night for a chance to see the London sky light up from its viewing platform. With a cash bar available, guests will be able to enjoy a glass of prosecco or a beer while they watch fireworks exploding across the city - the platform has floor to ceiling windows and provides views of up to 20 miles away so you can guarantee some spectacular sightings. There will also be the chance to add some thrill to your evening with a ride on The Slide, which is the world's longest and tallest tunnel slide. From cheap budget hotels to luxury 5 star suites see our discounts for hotels, including Le Meridien Piccadilly from 44% off.